Also fundamental to oneness 101 is how the ancient Israelites understood their one God. Did they conceive of Him as eternally existing in three persons or did they believe God to be single, whole, and indivisible without co-existing in three persons? Understanding the ancient Israelites' conception of one God has to be OUR understanding of one God. Remember, the first five books of the Bible were written by Moses. His God is the SAME God in the New testament. The ancient Israelites DID NOT have or rely on terms such as 'persons' (in regards to God), 'co-equal', 'co-existing', 'co-substantial', 'trinity', 'three-in-one', or 'persons in the Godhead.' These unbiblical terms came much later. They are the product of a few so-called church fathers who attempted to explain God through the intellect. But, perhaps unwittingly, concepts from paganism which lay in their subconcious minds were allowed to creep in too. A trinity or a God who subsists in three persons or one who is '3-in-1' is completely foreign to the Jewish mind today, and was just as foreign to Moses' and the Israelite's mind thousands of years ago. 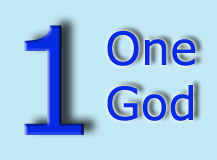 Oneness 101 is easy to grasp by just eliminating unbiblical terminology. NO ONE has to be able to explain God, or to even understand Him. Just like the demons, you must only BELIEVE that THERE IS ONE GOD. Faith is the key and it doesn't depend on using MAN INVENTED terms (which by the way, God didn't see fit to use). Rabbi Kasdan is a reformed Jew. The major difference between the reformed and orthodox Jew concerns the origin of the Torah (the first 5 books of the Old Testament.) The orthodox Jew believes the Torah was given by God to Moses; the reformed Jew does not believe the Torah came from God. However, both reformed and orthodox Jews believe in one, indivisible God. Following are my questions and Rabbi Kasdan's answers. What is your response to the trinitarian concept of God subsisting in distinct persons. "I can't view God as an individual personality. I can't even call God a personality. God does not have personhood.	" "There are no multiple gods no matter what other people believe in; that's their understanding of what's going on. Polytheism would therefore be viewed as a human understanding of the diety - it's a human frailty." What does 'echad' signify concerning God? "'Echad' is literally talking about the fact that there is one God in this entire universe. 'Echad' would certainly not be a composite, but a unity - a oneness ." "Yahweh is the truest identity of God. Everything else is (Elohim, El Shaddai, ect.) is a designation of an attribute, if you will, of a lesser level." Ephraim Speiser (1902 - 1965) begs to differ with trinitarian scholars who see plural pronouns in such passages as Genesis 1:26 providing justification for distinct personages in God. He was the chairman of the Department of Oriental Studies at the University of Pennsylvania.